White Paper Abstract: Development of post-acute partnerships with home health, skilled nursing facilities (SNFs) and hospice is emerging as a key strategy to stem hospital readmissions, according to new market data from the fourth annual Healthcare Intelligence Network (HIN) Reducing Hospital Readmissions Survey. More than half of survey respondents participate in post-acute partnerships, which serve to streamline processes and care transitions, and educate and align staff, respondents say. 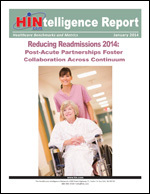 Download this HINtelligence report for more data on reducing readmissions in 2014, as reported by 116 healthcare companies. Included are details on readmission program components, successful work flows, processes and tools; how organizations are preparing for CMS scrutiny in 2014 and 2015, and much more.